A most important basic tenet of the British parliamentary system has been the supremacy of the British Parliament. With no written constitution the sovereignty of the British Parliament had remained unchallenged for centuries. Enter the EU with their bureaucratic complex system of government and administration and there is the inevitable cultural clash. The EU parliamentary system is comprised of no less than 14 institutions with seven principal decision-making bodies. The EU Court of Justice and the EU Court of Human Rights have been particularly active in chiselling away at Britain’s independence on British domestic issues impacting heavily on the doctrine of the supremacy of the British Parliament the underpinning foundation of Britain’s system of government, which has been under siege as a direct result of Britain’s membership of the EU. The British parliamentary system was never designed to become subservient to another system of government. It has evolved over centuries of bloody history into a unique system which ultimately depended on conventions and traditional respect by all members of the institution of government without the need for legislative compulsion. The dynamics for Brexit had been in play well before the referendum of 2016. The big three in the EU were Germany, France and Britain, three nations with a history of conflicts with each other, leaving a national legacy subliminally always at work with the public in Britain. In addition, there was also a significant difference in the political ideologies prevailing in Europe and Britain. In Europe, there is Germany led by the Social Democrats with a blend of hand-wringing liberalism mixed with a tinge of socialism. It was this ideology which demographically changed the face of parts of Europe by opening the EU borders to the millions of illegal migrants from all parts of particularly Islamic Africa. Then there is the rest of mainland Europe, especially southern Europe, which accommodates the bulk of the European population. Italy, Spain, France, Portugal, all traditionally hard-left socialist strongholds until relatively recently. The issue of unchecked illegal immigration has now created seismic shifts to the ultra-right. So far, we have identified conflict with the British Parliament’s sovereignty, the historic public antipathy towards Germany and France for different reasons and the gulf between conservative Britain and a blend of socialism and liberalism in the EU. This marriage was always destined to hit a brick wall from the perspective of the British public. David Cameron then committed what might well be regarded by historians as the greatest political miscalculation in British politics for several centuries. Under pressure from anti-Europe UKIP and the indefatigable Nigel Farage, troubling opinion polls and the right-wing tabloids, Cameron folded and decided to call a referendum on whether Britain should remain a satellite of the EU or leave the Union. A misinformed electorate, culturally anti-German and antipathetic towards the French, was handed over the decision-making process snatched from a highly informed and research supported House of Commons plus the expansively experienced House of Lords. Parliament through an errant and wobbly Prime Minister had abdicated its position of informed sovereignty and handed its supremacy of the uniquely British Parliament to a public, which simply did not possess the knowledge of what was ultimately at stake. If any proof was needed of the electorate’s anti-EU bias and the extent it was unprepared to make such a momentous decision the recent national poll conducted in Britain on Brexit provided that proof, with the result showing that 30 per cent of those polled preferred a hard no deal exit; regarded by leading economists as the very worst possible outcome for the country. So, it was no surprise that the argument for telling those Europeans to shove it won the referendum and plunged the country in a spiralling crisis. Cameron buckled to outside pressures and the result has been chaos. In theory it may not be too late to reverse the position with another referendum but the EU’s intransigence over the Irish border and their rough treatment of British Prime Minister Theresa May has further embittered public opinion and chances are a second referendum will produce the same or even a worse result than the previous one. Well -informed pundits now feel the point of no return has been passed and the UK will leave the EU this year or at least commence their exit officially this year. Many of the issues being canvassed now had not been raised or even debated publicly leading up to the 2016 referendum. The Irish border issue, the Gibraltar issue, the status of British expats in Europe, the still unfolding Scottish political position with the SDP threatening to use Brexit as an excuse for another referendum on the decoupling of Scotland from the British Union and remain part of the EU as an independent State. None of these and a plethora of other issues had been canvassed at the 2016 referendum. The current uncertainty is putting serious pressure on the British economy with finance reporters forecasting a significant drop in economic growth. The immediate future for Britain is now uncertain. Certain post-Brexit outcomes can be safely assumed at this stage. British global influence will decline outside the EU. The British economy will shrink, initially at least, the financial services sector a bulwark of the British economy will be decimated and much more, but the Brits are a tough lot. They have history on their side to the extent they perform best when the chips are down. Brexit presents several challenges to the UK and the EU Parliament and it will most likely be several years before all the ensuing issues identify themselves as the practical effect of Brexit starts to take effect. 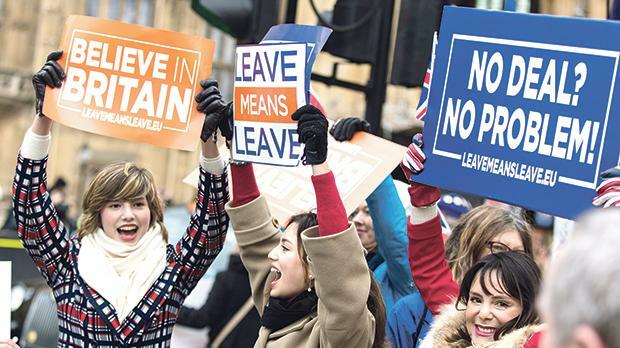 However, Brexit also offers new opportunities as a new vibrant Britain freed from the shackles of a rigid European bureaucracy may well flourish and prosper to a larger extent to what might have been the case if Britain had remained a member of the EU. Anthony Trevisan is a Maltese businessman with interests in mining based in London and West Australia.